Contains spoilers for The Walking Dead season 9, episode 5, "What Comes After"
The Walking Dead will live on. 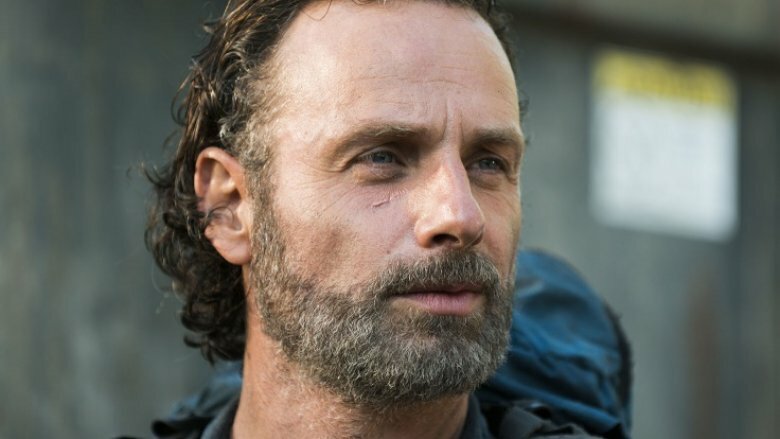 AMC has put into motion three feature-length Walking Dead movies, made for release on television and set to star former series lead Andrew Lincoln as Rick Grimes, who recently exited the show during the fifth episode of season 9. The Walking Dead chief content officer Scott M. Gimple, who served as showrunner until he expanded his role within the Walking Dead universe and passed the torch to standing showrunner Angela Kang, broke the news in an interview with The Hollywood Reporter. "The story of Rick will go on in films. Right now, we're working on three but there's flexibility in that," Gimple said. "Over the next several years, we're going to be doing specials, new series are quite a possibility, high-quality digital content and then some content that defies description at the moment. We're going to dig into the past and see old characters. We're going to introduce new characters and new situations." Production on the first of the television movies is slated to enter production sometime in 2019 and last roughly two months. Gimple is hard at work on the script, but plenty is still up in the air with respect to the project, particularly where filming will take place and when it will hit the small screen for public consumption. As The Walking Dead fans well know, the main motivator behind Lincoln's departure from the series was his desire to be closer to his family, who all reside in his home country of England. Will the Walking Dead films be shot overseas in the Queen's land, or will Lincoln have to eat his words and head back to the United States — namely Georgia, where the series is filmed — for the trio of projects? Answers are equally hard to come by when estimating when AMC will release the first Walking Dead television movie, despite Gimple giving a vague promise that the first film is coming "soon[er] rather than later." If the network begins principal photography in 2019, it's plausible that the pic won't premiere until 2020 at the earliest, if AMC gets started of production shortly after New Year's Day, and 2021 if the cameras don't start rolling until later in 2019. After Gimple became the CCO of the Walking Dead franchise — that is, the flagship show, the spin-off Fear the Walking Dead, and all video games, as well as projects yet to come — everything fell perfectly into place for Lincoln's Rick to leave the main series and literally fly off to a new place and time. Gimple explained to THR that the upcoming films will first chronicle the period between Rick's rescue and the time jump that came at the end of The Walking Dead season 9, episode 5, "What Comes After." Then, the stories will explore the years after that, each telling "a complete story" about the former sheriff. "Rick Grimes is an amazing character and Andy has done an amazing performance. There were story ideas brewing that, as the years went on, seemed very compatible with continuing to tell the Rick story in another format that would allow him time with his family," explained Gimple. "It is about who he is and who he's going to be — and certainly how he deals with the situation he's in. We know Rick Grimes, he would want to be home." He added that the movies will live in the same world as all other Walking Dead content, but that they'll focus on different stories. "It is the same rules but the environment of the walkers dictates its look," Gimple said. "So somewhere across the world, because of the climate, walkers might look very different. But this is still the same world of The Walking Dead … There is always the possibility of interconnectivity but we don't just want to tell those stories." Keeping Rick's story rolling in the world of The Walking Dead in not one but three movies is a bit risky, as it threatens to oversaturate viewers with the undead creatures, general horror, and blood and guts characteristic of the overarching franchise. Plenty of people have, for a variety of reasons, already stopped watching the show altogether — so there exists the worry that the impending television movies will push viewers even further away rather than reel back in those who jumped ship or hold onto those considering giving up on The Walking Dead. However, Gimple asserted that he's fully aware of the misstep Disney and Lucasfilm made with the Star Wars franchise in releasing one movie (a trilogy entry, then a standalone) each year, and noted that the Walking Dead films won't be released that quickly after one another — a decision made to avoid the dreaded The Walking Dead fatigue. "Oversaturation is a word I've been thinking about. We're not putting all this stuff out at once but have a very long view of everything," he said. "And we're not going to show them all at the same time." There's still much to learn about the Walking Dead movies, but it seems that Gimple has a solid plan for how to craft the projects to keep viewers hooked and give them new stories to obsess over and new characters to fall in love with. Plus, it's lovely to know that the goodbye fans said to Rick was actually a "see you later." Until we know more about the films, tune into The Walking Dead when it returns to AMC on Sunday, November 11 at 9 PM ET for the sixth episode of season 9, "Who Are You Now."